At the regular Board of Directors meeting on February 27, Ridgefield School District’s Boundary & Start Time Committee presented a proposal regarding changes to the district’s school boundaries and school start times to take effect in 2018-2019. The district, realizing that adjustments to boundaries and start times are necessary to serve continued rapid growth and the opening of new schools, formed the committee in fall, 2017. The 15-member committee is comprised of district and school administrators, KWRL transportation representatives, teachers representing each school, and parents representing each school. Work began even before the committee’s first meeting on October 30. On September 15, the district made available a survey requesting feedback that would assist the committee in establishing the core values and principles necessary to guide the decision-making process. An unprecedented 725 responses were received, including 613 from parents (84.6%) and 112 from staff (15.4%). The committee reviewed research from expert organizations that included American Automobile Association, Centers for Disease Control, and the American Academy of Pediatrics, along with student achievement and attendance data from Ridgefield High School and first-hand experiences from school districts who made start time changes. While studies recommend ideal secondary school start times between 8:30 – 9:00 a.m., student achievement and attendance data at RHS indicated that the current start time is serving students well. The committee expressed concern that unnecessarily moving the secondary schools start times even later would have negative unintended consequences. Adjusting the school day still later into the afternoon would increase the number of students leaving school early for academic, athletic, and other extra-curricular events on a regular basis. “We take great pride in the fact that such a high percentage of our students participate in at least one after school activity. These opportunities are foundational to the overall educational experience we aspire to ensure for every student,” said Christen Palmer, RHS principal and a member of the committee. The proposed start time for elementary level schools was determined based on the core value for age-appropriate transportation. Currently, K-12 students ride buses together. This has been a district concern, shared by many parents for some time. By adjusting elementary students (K-4) to one start time (9:05 am) and secondary students (5-6, 7-8 and 9-12) to a different start time (8:00 am or 8:05 am), this core value is achieved. KWRL Transportation will be able to increase age-appropriate transportation even further. Approximately 50% of the bus runs for Sunset Ridge/View Ridge and RHS will only transport students from their school site. That means that half of all Sunset Ridge and View Ridge students will be transported on buses that only serve grades 5-8. To accommodate the need for daycare in advance of this start time change, the district is working with Educational Service District 112’s Southwest Washington Child Care Consortium (SWCCC) to increase availability. SWCCC currently provides daycare in Ridgefield schools. In addition to increasing spots through SWCCC, the Ridgefield School District is working with Ridgefield High School to start a Child Development Center. While it will be limited to a small number of students in the initial pilot program that starts next year, the district is determined to grow the program, increasing the number of students served. The committee also focused on the core value of reducing student ride time. The proposal reduces ride time in a variety of ways. Transporting K-4 students on their own bus will save 15 minutes of ride time since buses will not need to drive from elementary sites to Sunset Ridge (saving approximately 7-8 minutes) and load Sunset Ridge students (saving an additional 7 minutes). Overall, K-4 students will experience the shortest ride times among the grade levels. The committee is proposing to move students residing in the carve-out in the Pioneer Canyon subdivision region back to Union Ridge. Years ago, these neighborhoods were shifted to the South Ridge boundary area due to lack of space at Union Ridge. The adjustment created transportation inefficiencies and reduced neighborhood school attendance. Returning the carve-out to their neighborhood school will increase transportation efficiency and adhere to the core value of neighborhood school attendance. Nearly 800 new homes are currently planned for construction behind Ridgefield High School, on both sides of Royle Road and south of the new 5-8 campus. If boundaries were not adjusted, students moving into these subdivisions would have added to the rapidly-expanding enrollment at Union Ridge, which is already one of the state’s ten largest elementary schools. 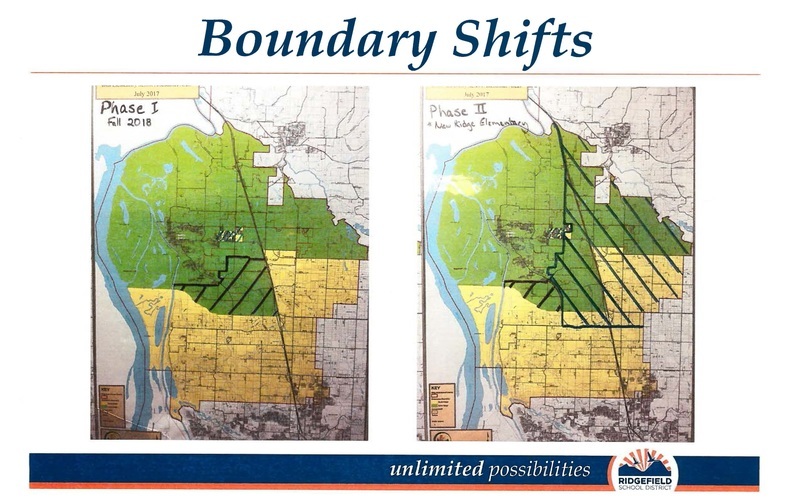 The committee proposes a northward shift (Phase I on map) in the boundary between South Ridge and Union Ridge. This shift moves newer developments from the Union Ridge boundary area into the South Ridge boundary area, balancing school attendance zones. The district realizes the challenges associated with boundary adjustments and the impact they have on students. To prevent current third graders from moving to a new elementary school for their final year, the district will automatically approve boundary exceptions. This will allow next-year’s fourth grade students to remain in their current school if they so choose. The district will also continue to allow all students to apply for in-district boundary exceptions. To ensure operational efficiencies and create greater equity, the committee recommends adhering to the expectation that student transportation is the responsibility of parents and guardians for all in-district boundary exceptions. Looking ahead, a Phase II boundary shift will be needed when the district’s third elementary school (proposed for the east side of the I-5 freeway) is opened. The new elementary boundary will balance elementary student populations among all three sites as well as maximize neighborhood school attendance. “Ridgefield is such a special, close-knit community. I’m excited that our youngest students will be able to continue the tradition of maintaining community in neighborhood elementary schools,” said Georgianna Jones. The Boundary & Start Time Committee adhered to the district’s commitment to engage with the community, gather feedback, and utilize a deliberative decision-making process. Individuals serving on the committee were required to make a serious time commitment. The school board is expected to take action on the committee’s recommendations on Tuesday, March 13 at their next scheduled Board of Directors meeting. For more information about the work completed by Ridgefield School District’s Boundary & Start Time Committee, visit their webpage at http://www.ridgefieldsd.org/boundary-start-time-committee.